Personalizing your daily ride is a great way to make a statement. 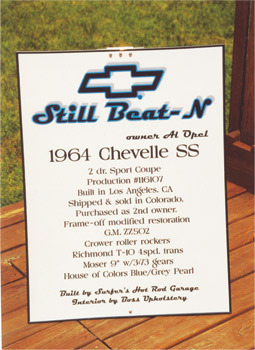 We can work with you to come up with a theme or just some lettering. If you want a full wrap, we can do that too. The owner of this coupe's last name starts with a "W" so we created a very personal graphic for him. 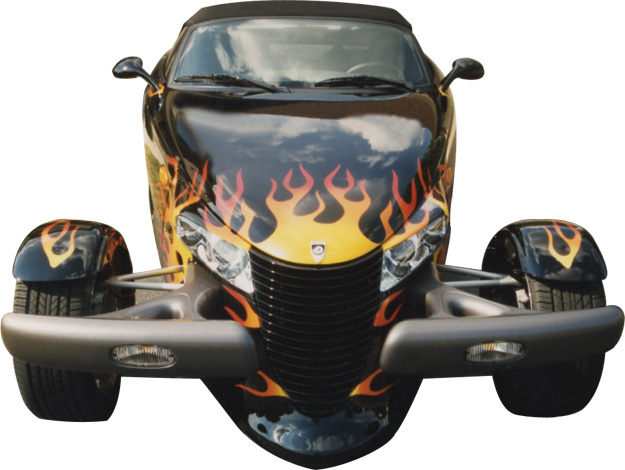 This Prowler takes on a more aggressive look when we added the digitally printed flames. They can easily be removed in the future. If camo is your thing, we have several different looks that can be used as an accent or even a full wrap. 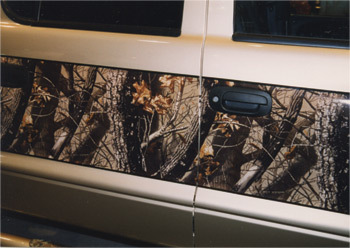 Be careful if we wrap you truck, you might not find it in the woods, it's that realistic. 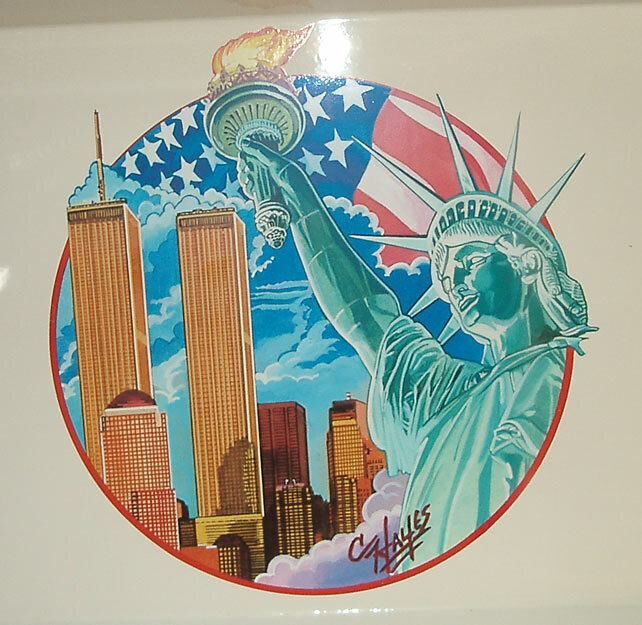 Artist Cliff Hayes created this wonderful tribute to 911. 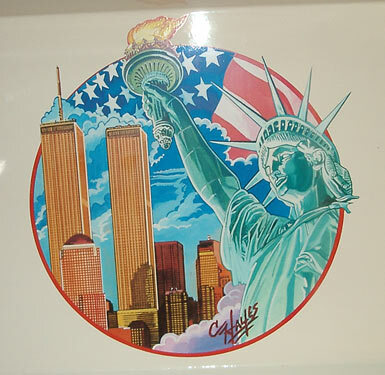 We turned it into a decal for our customer who commissioned the artwork. 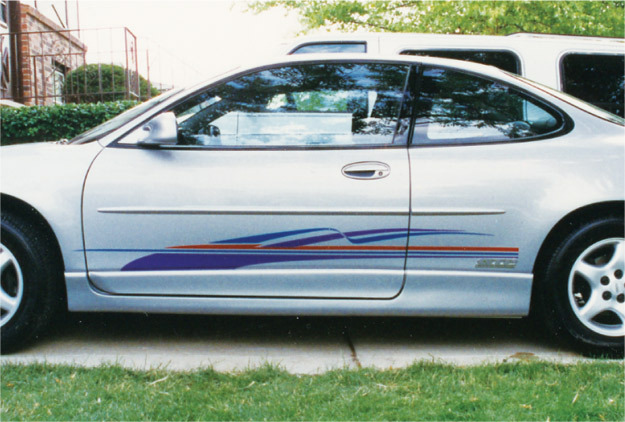 The decal was placed on a vehicle makes a statement on this show vehicle. 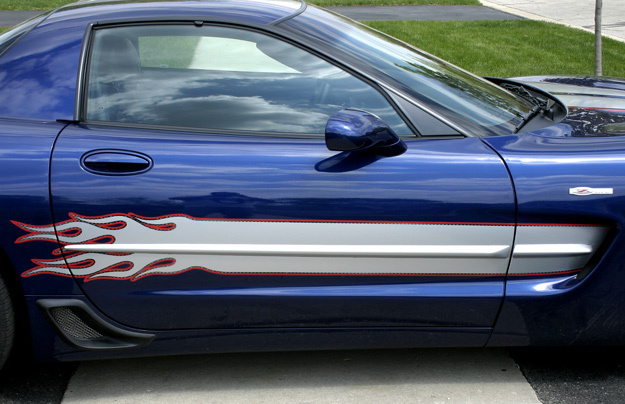 This Vette came from the factory with a silver/faux carbon fiber/red on the hood, roof & rear. We copied the style & added side stripes ending in flames. 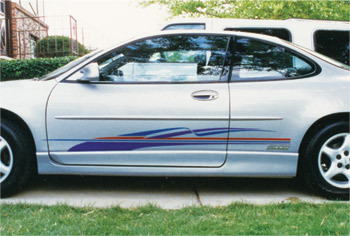 We also wrapped the side moldings in silver. 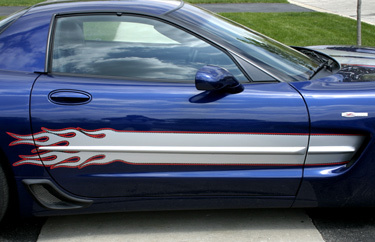 A close-up of the Vette's flames shows the carbon fiber look. 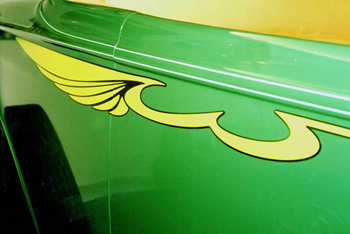 A simple graphic that adds a bit of color to this ride. 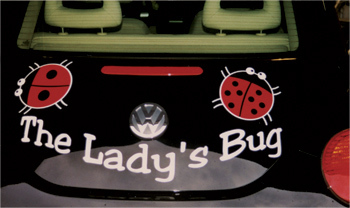 What a fun graphic for this Beetle, just makes you smile & think of warm places. 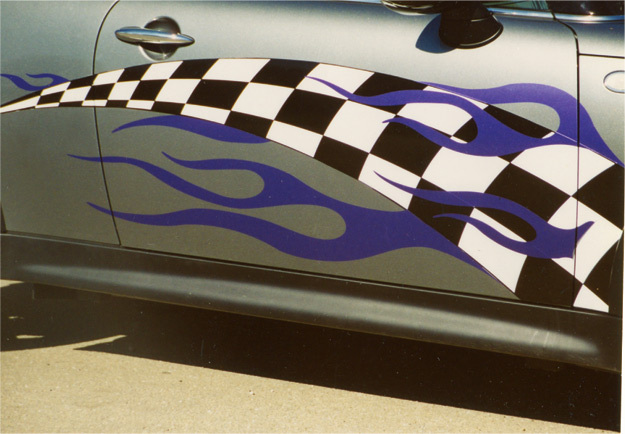 An eye catching graphic on this Mini. We transformed this Bug into "The Lady's Bug" for a retiree that is obsessed with lady bugs. They are all over the car. 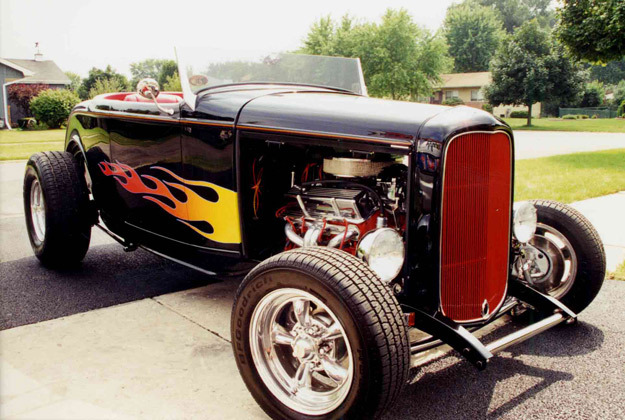 Old School flame job on this beautiful coupe. 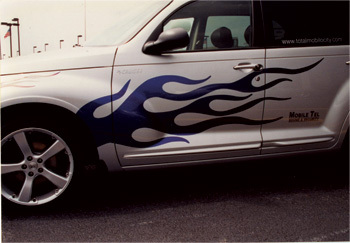 The flames are digitally printed with a thin blue outline then laminates & computer cut to shape. Here is the full view of the Mini. Nice combo we came up with when the gal who owns it couldn't decide if she wanted flames or checker board....gave her both. 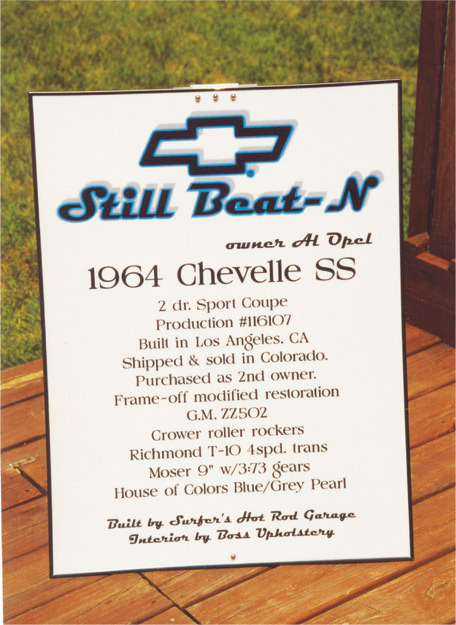 We can make your car show display board from this simple layout to something really crazy. 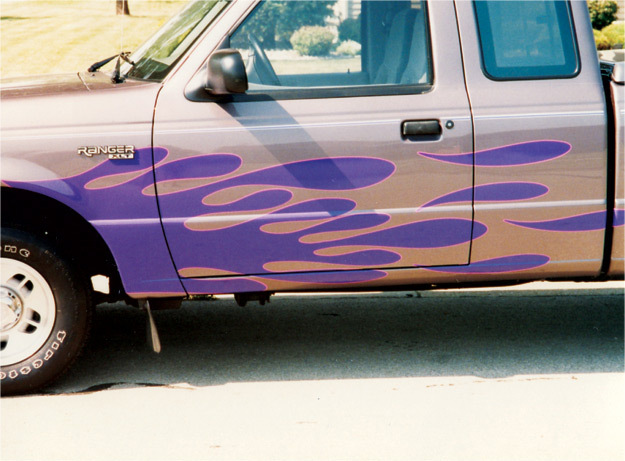 Striking colors really turn heads. This was done for a retiree too. 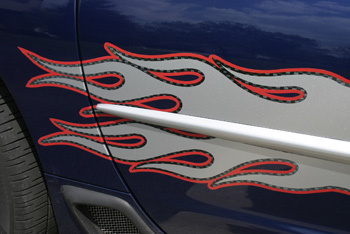 Flames seem to be the most popular motif we get asked for. 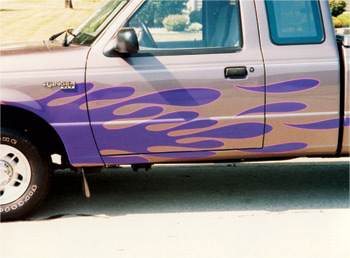 These flames are done in color shift vinyl........it changes color depending on what angle you look at it from blue to purple. We have other color shift colors available too.